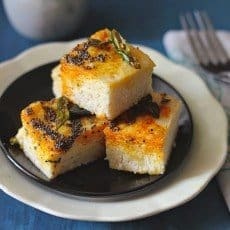 Gujarati Khatta Dhokla is steamed rice and lentil fudge seasoned with curry leaves, mustard seeds with splash yellowish red of turmeric and red chili powder. Gujarati Farsans (Snacks) have unique persona each with distinguished cooking method, peculiar taste profile, appetizing presentation and low on calorie count. 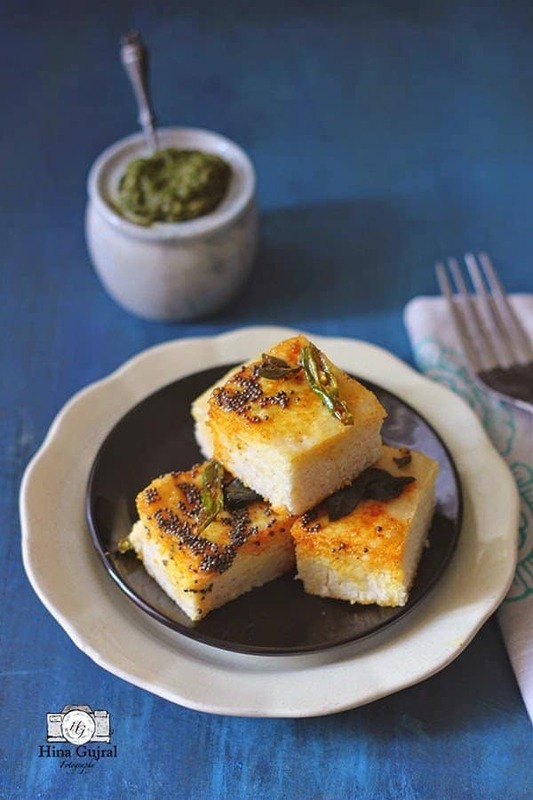 One such traditional snack from the Gujju land is Khatta Dhokla though the name sounds very similar to Khaman Dhokla but both are quite opposite in all sense from making to flavor, the only similarity I guess is cooking method – steaming. Steaming is a fascinating cooking method so quiet, hassle free and tranquil withdrawing minimal nutrients from the food, no wonder it’s one of the most favorable cooking methods in some of the first world countries. 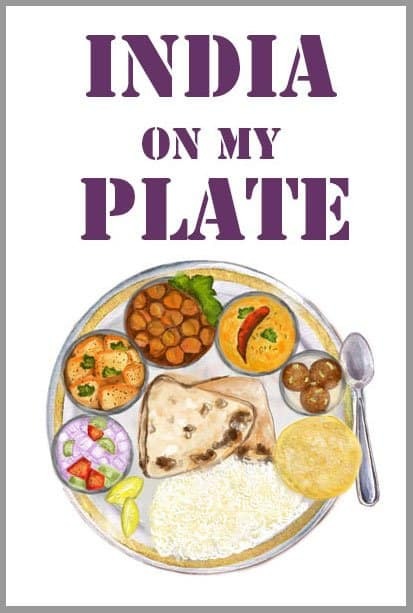 Those who like to keep tap of fat/oil used in daily meal steaming is one solution to splurge into variety of dishes in a guilt free manner. Recently while I was reading in detail about steaming technique I stumbled on the fact that most of ingredients can be cooked through steaming and could be transform into nourishing tasty meals. When successful brands like Tupperware work towards food for thought it should be appreciated, last year Tupperware Team launched Care4food Campaign (read here) to reduce wastage of food by better storage I whole-heartedly agreed to be part of such a thoughtful crusade. Tupperware Steamer is an engineered revolutionary product with features for safe and hygienic cooking. The steamer has two steam vents on the cover which life the steam away from the handle for safety and a grooved water drainage channel on the inside, prevents water droplets from dripping back onto the food surface. Solid food items can be placed directly over the spacious plates of the steamer or metal plates can also be used as well, like for Khatta Dhokla I used medium size baking tray to steam the batter. So now make steaming a habit in your kitchen as it retains all the nutrients, taste, aroma and color of the food – a healthy way of life with Tupperware Steamer. 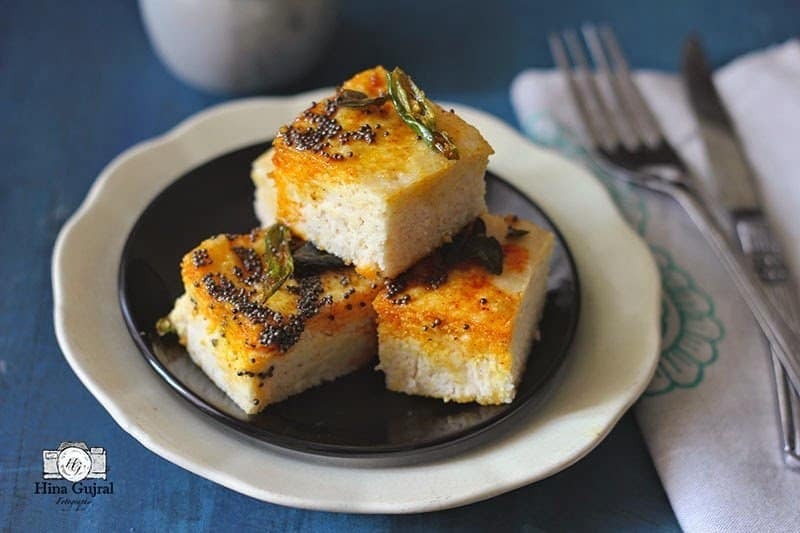 Gujarati Khatta Dhokla is steamed rice and lentil fudge seasoned with curry leaves, mustard seeds with splash yellowish red of turmeric and red chilli powder. To prepare the batter for Dhokla, clean, wash and soak rice, and lentils in water for 6 hours or overnight. Grind the soaked rice, lentils along with green chillies, ginger using curd to blend the mixture. If the batter is too thick than 2 to 3 tbsp of water can be used to grind it. The consistency of the batter should be such that when you use a ladle to pour it does not pour itself but falls in dollops. Stir in the salt and allow the mixture to ferment in warm place for 8 hours or maybe overnight. Fermenting time usually depends on the weather outside. During summer season it takes less time than winters. Once fermented you will notice the dough has increased in volume and a sour aroma will release once you bring out the batter. Gently stir in the 1 tbsp oil. Grease one flat plate with oil all round the sides and the base. To heat Tupperware Steamer, fill wide large pan with water and put it over medium to high heat. Once water starts simmering arrange Tupperware Steamer over it (as directed in the instruction manual). Add fruit salt to the batter and stir to combine evenly in batter. Immediately pour in batter to the greased plate. Leven the batter with the back of a spoon. Place the dhokla plate in steamer and steam for about 10 minutes on high heat, until the Dhokla is cooked that when a tested inserted into the center comes out clean. Remove Dhokla from the steam, and let it sit for 10 minutes before tempering. For tempering, heat oil in a small pan on medium heat; add the mustard seeds, curry leaves, asafoetida and allow them to crackle. Then add turmeric and red chili powder fry for 1 – 2 second. Turn off the heat. Pour the seasoning over the Khatta Dhokla. 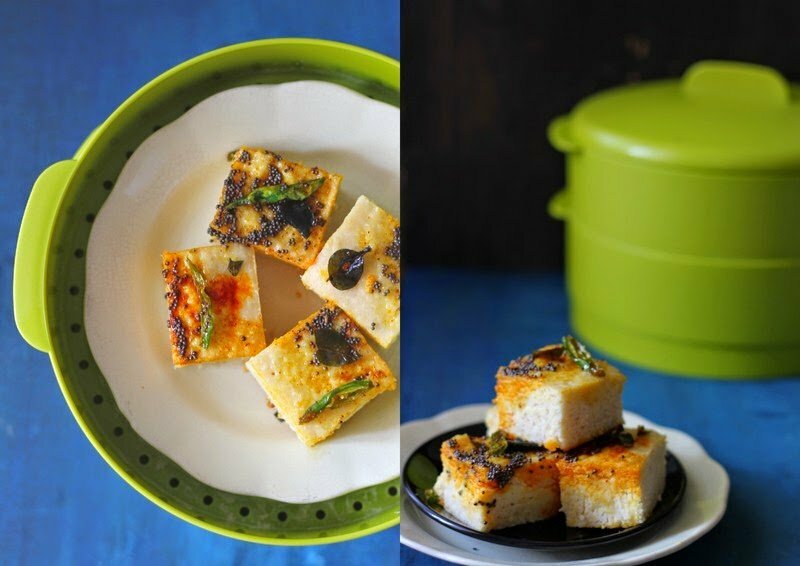 Cut the Khatta Dhokla into desired shapes and serve with Green Chutney.